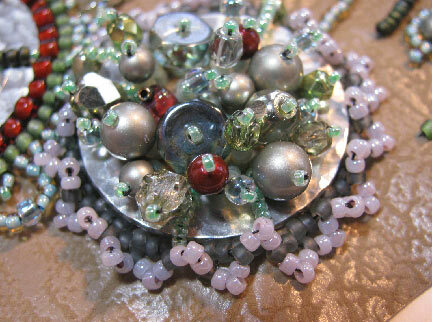 My necklace for April is called My Place in the Sun, because April started out in typical New England fashion this year (lousy!) and I was sure I'd never see a warm day again. But here we are at the end of the month, and the warm sunny days are multiplying! I received some metal blanks from ImpressArt of a brand new metal alloy called Alkeme, and so I used those for my stamped and textured cabochon pieces. I'll be posting a tutorial, so stay tuned if you want to see how the cabochon was made. 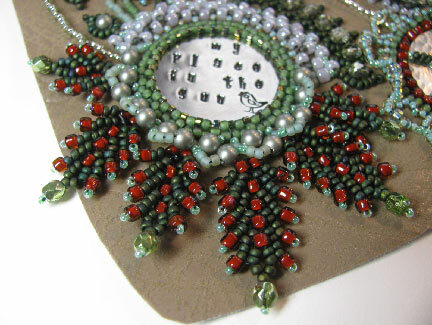 The entire necklace was decorated with a mixture of back stitch and the bead woven embroidery stitches that I developed for Bored By Back Stitch. This necklace, along with Turning of the Tides from last month will be featured in the second chapter of that e-book, coming soon! Totally "the Cyndi look"... 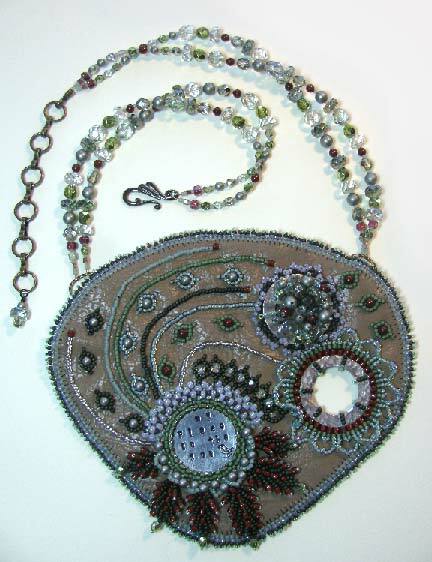 I remember your April piece for the first year of the BJP... You've used the same colors and a similar mix of texture. Both pieces suggest growth and life! Fabulous!